This past year the Trauma Care Coalition was successful in pressuring the University of Chicago to raise the age limit of their children's trauma center from 16 to 18. But trauma doesn't stop at 18 and so our fight continues. 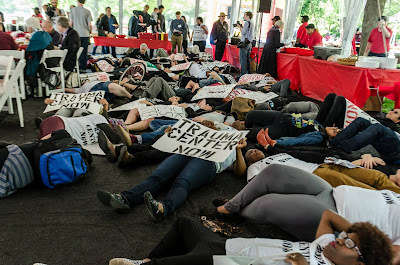 The first week of June the Trauma Care Coalition held a powerful week of action which included a sit in at the University of Chicago Administration building, rallies, marches and a die-it at the University Alumni Weekend. The 9 protesters who sat in, included community leaders, students and alumni. They were demanding a meeting with University of Chicago President Zimmer who, after 5 years, has yet to meet with leaders of the campaign. Instead after two and a half hours of the sit-in the University called the fire department to ax through drywall, break windows, and saw through doors in order to arrest the protestors. The University had the protestors detained for 45 hours and charged them with trespassing, mob action and resisting arrest. The University's attempt to remove and silence protest has had only emboldened our campaign. Hundreds of community members, faith leaders, students, alumni and others have mobilized into action to draw attention to the lack of a south side trauma center and the need for the University to address this issues to full fill its responsibility and show that it values black life.